Wise women believe that most of the problems of pregnancy can be prevented by attention to nutrition. Morning sickness and mood swings are connected to low blood sugar; backaches and severe labor pains often result from insufficient calcium; varicose veins, hemorrhoids, constipation, skin discoloration and anemia are evidence of lack of specific nutrients; preeclampsia, the most severe problem of pregnancy, is a form of acute malnutrition. Excellent nutrition includes pure water, controlled breath, abundant light, loving and respectful relationships, beauty and harmony in daily life, joyous thoughts and vital foodstuffs. During pregnancy nutrients are required to create the cells needed to form two extra pounds of uterine muscle, the nerves, bones, organs, muscles, glands and skin of the fetus, several pounds of amniotic fluid, a placenta and a 50 percent increase in blood volume. In addition, extra kidney and liver cells are needed to process the waste of' two beings instead of one. Wild foods and organically grown produce, grains and herbs are the best source of vitamins, minerals and other nutrients needed during pregnancy. All the better if the expectant mother can get out and gather her own herbs: stretching, bending, breathing, moving, touching the earth, taking time to talk with the plants and to open herself to their spiritual world. Wise women have recommended herbal tonics for childbearing for thousands of years. These herbs are empirically safe and notably effective. Tonic herbs improve general health by balancing and sustaining energy flow and focus in the body. Tonics allay annoyances and prevent major problems. They can boost the supply of vital minerals and vitamins, increase energy and improve uterine tone. Some uterine tonics are contraindicated during pregnancy or are restricted to the last few weeks of pregnancy. The tonics indicated for pregnancy need to be used regularly; a tonic is to the cells much as exercise is to the muscles: not much use when done erratically. Of course even occasional use of tonics during pregnancy will be of benefit, since they do contain nourishing factors. Better benefit will come from using them 5 times a week or more. Some simple suggestions to get into the habit of' using tonics: pregnant women could replace the morning cup of coffee with a rich Nettle infusion. Or she could brew up some raspberry leaf tea and put it in the refrigerator to drink instead of soda, wine, or beer. Wild greens can be added to the diet. Women in many cultures have used the following herbs for centuries to have a healthier pregnancy. Brewed as a tea or as an infusion, raspberry is the best known, most widely used, and safest of all uterine and pregnancy tonic herbs. It contains fragrine, an alkaloid which gives tone to the muscles of the pelvic region, including the uterus itself. Most of the benefits ascribed to regular use of Raspberry tea through pregnancy are traced to the nourishing source of vitamins and minerals found in this plant and to the strengthening power of fragrine - an alkaloid which gives tone to the muscles of the pelvic region, including the uterus itself. Of special note are the rich concentration of vitamin C, the presence of vitamin E and the easily assimilated calcium and iron. Raspberry leaves also contain vitamins A and B complex and many minerals, including phosphorous and potassium. ~ Increasing fertility in both men and women. Raspberry leaf is an excellent fertility herb when combined with Red Clover. ~ Easing of morning sickness. Many attest to raspberry leaves' gentle relief of nausea and stomach distress throughout pregnancy. Less well known as a pregnancy tonic but deserving a kinder reputation and use, Urtica is one of the finest nourishing tonics known. It is reputed to have more chlorophyll than any other herb. The list of vitamins and minerals in this herb includes nearly every one known to necessary for human health and growth. Vitamins A, C, D and K, calcium, potassium, phosphorous, iron and sulphur are particularly abundant in nettles. The infusion is a dark green color approaching black. The taste is deep and rich. If you are blessed with a nettle patch near you, use the fresh plant as a pot herb in the spring. Some pregnant women alternate weeks of nettle and raspberry brews; others drink raspberry until the last month and then switch to nettles to insure large amounts of vitamin K in the blood before birth. ~ Aiding the kidneys. Nettle infusions were instrumental in rebuilding the kidneys of a woman who was told she would have to be put on a dialysis machine. Since the kidneys must cleanse 150 percent of the normal blood supply for most of the pregnancy, nettle's ability to nourish and strengthen them is of major importance. Any accumulation of minerals in the kidneys, such as gravel or stones, is gently loosened, dissolved and eliminated by the consistent use of nettle infusions. ~ Increasing fertility in women and men. ~ Nourishing mother and fetus. ~ Easing leg cramps and other spasms. ~ Diminishing pain during and after birth. The high calcium content, which is readily assimilated, helps diminish muscle pains in the uterus, in the legs and elsewhere. ~ Preventing hemorrhage after birth. Nettle is a superb source of vitamin K, and increases available hemoglobin, both of which decrease the likelihood of postpartum hemorrhage. Fresh Nettle Juice, in teaspoon doses, slows postpartum bleeding. ~ Reducing hemorrhoids. Nettle's mild astringency and general nourishing action tightens and strengthens blood vessels, helps maintain arterial elasticity and improves venous resilience. ~ Increasing the richness and amount of breast milk. Of course calcium is a mineral, not an herbal tonic, but it is so important during pregnancy and throughout our woman lives that I consider it a tonic. Lack of adequate calcium during pregnancy is associated with muscle cramps, backache, high blood pressure, intense labor and afterbirth pains, osteoporosis, tooth problems, and preeclampsia. ~ The best food sources of calcium are fish dairy products, but there is controversy about the assimilability of calcium from pasteurized, homogenized milk. My preferred food sources include goat milk and goat cheese, salmon, sardines, mackerel, seaweed (especially kelp), sesame salt (gomasio), tahini and dark leafy greens Such as turnip tops, beet greens and kale. ~ There are roughly 200 mg of calcium in two ounces of nuts (excluding peanuts), one ounce of dried seaweed, two ounces of carob powder, one ounce of cheese, half a cup of cooked greens, (kale, collards and especially dandelion) half a cup of milk, three eggs, four ounces of fish, or one tablespoon of molasses. ~ Most wild greens are exceptionally rich in calcium arid the factors need for calcium absorption and use. lambs quarters, mallow, galinsoga, shepherd's purse, knotweed, bidens, amaranth and dandelion leaves all supply more calcium per 100 grams than does milk. ~ Bones soaked in apple cider vinegar release their calcium into the acidic vinegar. A tablespoon of this vinegar in a glass of water supplies needed calcium and relieves morning sickness too. ~ Many fruits are rich in calcium (though not as rich as the above foods). Dried dates, figs raisins, prunes, papaya and elderberries are the best source. ~ Raspberry leaf infusion contains calcium in its most assimilable form. Assimilation is further enhanced by the presence of phosphorous and vitamins A and C in the raspberry leaves. ~ Fresh parsley and watercress are available in most grocery stores year round. They are both good sources of many minerals and vitamins, including calcium, phosphorous, vitamin A and vitamin C.
~ Nettle Infusion supplies calcium and phosphorous, vitamin A and the vital vitamin D, in a readily assimilable form. ~ Foods that are thought to interfere with absorption of calcium should be avoided: spinach, chocolate, rhubarb and brewer's yeast. ~ Do not use bone meal or oyster shell tablets as sources of supplemental calcium. They have been found to be high in lead, mercury, cadmium and other toxic metals. Squaw Vine (Mitchella repens), Blue Cohosh (Caulophyflum thalicotroides), and Black Cohosh (Cimicifuga racemosa) all should be avoided until the last 4 to 6 weeks of pregnancy. Even then, they should be used only when indicated, and under the supervision of someone experienced in their use. Some midwives report that the Cohoshes must be used together (not interchangeably). Others have reported premature labor when Blue Cohosh was taken in combination with Pennyroyal. False Unicorn Root (Helonias dioica), Dong Quai (Angelica spp.) and PN6 capsules are considered too strong for use during pregnancy. * Another important herbal ally for women over forty who desire a child is chaste tree (Vitex agnus-casti). It has been used in Africa and parts of Europe for several thousand years to discourage the male libido. In women, the effects seem to be the opposite! It may also be a fertility enhancer. Most importantly, chaste tree is a strengthening tonic for the pituitary gland, the master control gland for the endocrine system. Daily use of the tincture of the berries (1 dropperful/1 ml 2-3 times daily) had been shown to increase progesterone--the hormone of pregnancy--and luteinizing hormone--which promotes conception. Because it can lower prolactin levels, chaste tree is best discontinues during the last trimester of pregnancy. * Dong quai (Angelica sinensis) is not recommended for women over forty. In general, this herb promotes blood flow to the uterus and surrounding tissues. This can promote the growth of fibroids and increase the risk of post-partum hemorrhage. Ginger is a better warming tonic; motherwort is better at relieving pain; and raspberry is better at preparing the uterus for birth. * Regular moderate exercise combined with affirmations and creative visualizations tones the body and the mind. Ten minutes of exercise done regularly does more to prevent fatigue and depression than an occasional arduous workout. * Deep relaxation is a powerful tool for easing emotional and physical stress. It can be done as a break in the day's demands, just before sleep, or just after waking. See page 62 for a complete relaxation to read or tape. * Meditation refreshes and centers the mind. * Affirmations, visualizations, and forms of active or guided meditation, are important emotional and psychic tools, and are easy to use. Check the resource listing at the end of this chapter for self-help guides to learning and using these skills. * Indulgence (of yourself, not your obsessions) helps prevent fatigue and depression. Give yourself time to read and relax and create and be easy. Take a stern stand with your guilt about keeping the house clean, or making breakfast for everyone, or excelling at your work, or whatever you ride yourself about. There will be plenty to do when the baby is born; don't exhaust yourself now. * Your body's need for minerals and proteins soars during pregnancy. Lack of either registers as a craving for sweets. * Eating sugar may case blood sugar swings, fatigue, and depression. Eliminate white sugar, and restrict honey, fructose, maple syrup, etc. Focus on high protein snacks, such as nuts, yogurt, popcorn with nutritional yeast, sardines, and cheese. * Raspberry leaf infusion calms; adds up to half as much Peppermint or Spearmint for a lift of spirits and a renewed sense of energy. * Burdock, Blessed Thistle, and Sarsaparilla are bitter tonics. Occasional use helps keep your emotions on an even keel and makes a nice change from your daily Nettle or Raspberry leaf brew. * Motherwort tincture calms without causing drowsiness, making it ideal as an ally at work and at home, whenever pressure and stress threaten to overwhelm you. Try five drops in a small glass of water to restore emotional balance. Allow fifteen minutes for the full effect to come on; repeat if necessary, as frequently as every two hours during times of particular upset. Motherwort tincture works best when combined with a short break from the day's routine to stretch, breathe, relax, and return to center. * Skullcap tincture provides deep, refreshing sleep. Take up to thirty drops of commercial tincture (from dried plants) or 5-15 drops of fresh plant tincture half an hour before you go to bed. An infusion of the dried plant nourishes and strengthens the nerves. Drink two cups daily for several months if your nerves feel frayed and you are easily upset. I hope everything is going wonderfully at the Wise Woman Center!! I'm 4 months pregnant, and have a few questions that I was hoping Susun might choose to address on Blogtalk Radio. I have read and relied upon her fantastic book, Wise Woman Herbal for the Childbearing Years, but I'm seeking further clarification on a few specifics! Is it really safe to use the tincture of Motherwort for anxiety during pregnancy? When I am not pregnant, Motherwort provides me relief from acute anxiety. My midwives and the internet insist that Motherwort is an unsafe herb during pregnancy. I'm not sure they are aware of differences between preparations of Motherwort (tincture vs. infusion and so forth) but I didn't want to risk it without consulting an experienced herbalist. Another question! Surprisingly, (to me) marijuana seems to be considered a safer remedy for anxiety during pregnancy than does motherwort tincture. Any illumination on this that you can offer would be appreciated! Perhaps it is misinformation? I always thought that marijuana during pregnancy could impact fetal development, but it is legal in my state and the belief that it is perfectly safe for use by pregnant women is widespread. And finally, can one drink lemon balm infusion safely during pregnancy? Drinking Nourishing herbal infusions will help to stabilize your moods and increase your energy as well. If you are not making these on a regular basis, here are some youtubes to check out on how to make them. They are all safe nourishing herbs considered to be foods. Motherwort is one of my most trusted allies. She is in the mint family, if you feel safe drinking mint tea then you can feel safe taking motherwort tincture while pregnant. Motherwort actually strengthens the capillaries in uterus and the heart. Best if taken in tincture form made from the fresh flowering plant in small frequent doses. Best if you ask Susun directly about marijuana consumption during pregnancy. My personal thought is whatever works best for you. I do not think it is unsafe unless it is being habitually used/abused, but using it medicinally, no problem. Please do not make any infusions from aromatic herbs for internal consumption. I'm not sure what you are wanting to use lemon balm for, anxiety? I personally do not like the way lemon balm makes me feel when I drink tea from it or tincture of it. But it is a very useful herb and some people that need it tolerate it just fine. Thank you for writing in and please let me know if you have anymore questions for me. A caller on blogtalkradio, asks about what to do to help her body and mind heal after a medical abortion. 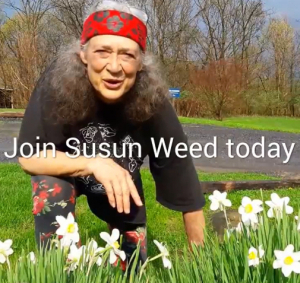 Susun Weed teaches about the healing properties motherwort has for the body, mind and spirit. She also talks briefly about daylilies and how they aid women.